Seattle sent reliever Emilio Pagan and minor league infielder Alexander Campos to complete the trade. The Mariners have found their starting first baseman for 2018 and possibly beyond. With the Major League Baseball general managers’ meetings finished in Orlando on Wednesday, Mariners GM Jerry Dipoto didn’t let the three-day affair go by without making a roster move. 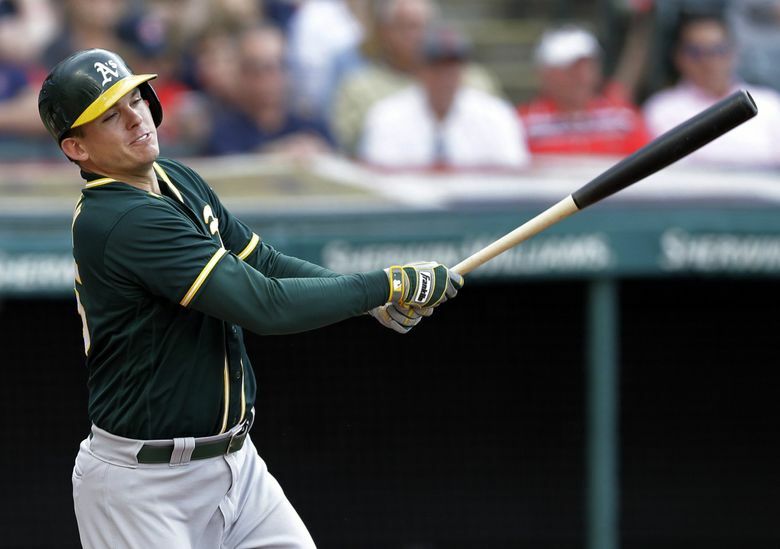 Dipoto finalized a trade for infielder Ryon Healy from the Oakland A’s, giving up reliever Emilio Pagan and minor-league infielder Alexander Campos. Healy, 25, hit .271 (156 for 576) with 29 doubles, 25 home runs and 78 RBI in 149 games last season. It was his first full big-league season. He played 39 games at first base, 34 games at third and 78 games as the designated hitter. Against left-handed pitchers, Healy hit .314 (43 for 137), slugged .526 and had eight doubles and seven home runs. Dipoto was clear that Healy is the everyday first baseman. With touted prospects Matt Chapman and Matt Olson slated to man third and first, respectively, for the A’s, Healy’s time would’ve been spent at designated hitter. It also made him expendable for an Oakland team that was desperate for relief pitching. A third-round draft pick out of the University of Oregon in 2013, Healy made his major-league debut with the A’s on July 15, 2016 and played in 72 games that season. He posted a .305 (82 for 269) average with 20 doubles, 13 home runs and a .524 slugging percentage, earning All-Rookie Team honors from Baseball America. He seemed excited about playing in Seattle. Healy is another controllable asset for Dipoto. He joins Ben Gamel, Guillermo Heredia and Mitch Haniger, who were all rookies last season. He makes the MLB minimum of just over $500,000 and doesn’t reach his first year of arbitration until 2020 and free agency till 2023. Yonder Alonso, Mitch Moreland, Lucas Duda and other veterans were available via free agency, but the cost would have been significantly more. That gives Seattle more money to address other areas, specifically outfield and starting pitching. The move to add Healy came with a cost in giving up Pagan, who was a major contributor for the Mariners’ bullpen last season. Pagan, 26, went 2-3 with a 3.22 ERA with 56 strikeouts and eight walks in 34 relief appearances and 51 1/3 innings. Despite not being invited to big-league spring training, Pagan made the most of the Mariners’ revolving door at the long-relief spot. He made his initial appearances in long relief and graduated to higher-leverage situations. Campos, 17, was signed as a non-drafted free agent on July 4, 2016. He played his first professional season with the DSL Mariners in the Dominican Summer League, batting .290 (60 for 207) with 10 doubles, two home runs, 26 RBI, 41 walks and seven stolen bases in 59 games. His primary position is shortstop, but some scouts have projected him as a second baseman.